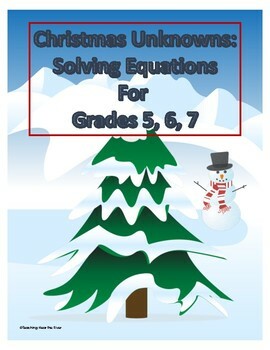 Your students will love writing and solving both expressions and equations centered around a Christmas theme. 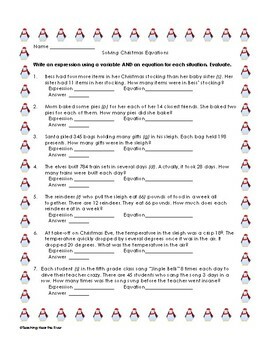 This product includes a worksheet full of Christmas situations for which an expression using a variable should be written, as well as a worksheet that students will create and solve equations for Christmas-themed problems. Additionally, a game is included that pits partners against each other to solve equations in order to steal their opponent's cards. Everything in this product can be used in math centers, for bell work, or as practice. 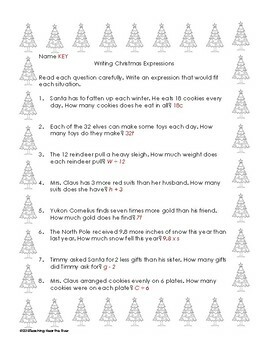 Answer keys are included for the worksheets and the game to make your life just a little easier during the stressful lead-up to the holiday break.